Get There, Get Around - You Should Visit Japan! Easing your travel to there, and then travel around Japan with ease. One of the things that intimidates some folks from visiting Japan is The Big Flight. From the continental U.S., the shortest flight is going to be at least eleven hours. That's a long time to be sitting in economy. But it can be done and you can do it, trust me. The day before. Make sure you're packed, all of your clothing and gear is inventoried, including the souvenirs from home you're taking to your friends in Japan. (Souvenirs are important to remember when traveling to Japan, as I learned from my first trip.) Take a day or two off from work to make sure you have everything done. You might be exhausted the night before your flight, but that's better than being exhausted when you get on the plane. Also, drink some electrolytes (Gatorade, for example) the day before, to hydrate yourself for the plane's lack of humidity. Don't forget to get a pair of compression socks to wear during the flight. Earplugs. The cheap foam kind you can buy at any drugstore. An inflatable air pillow. I think mine is from Big Agnes. I've had it so long, I don't remember. A dry washcloth in a locking sandwich bag. I'll explain why in a moment. Face masks. No, not the Jason style. The ones you see Japanese people wearing when they're sick. Travel-sized toothpaste and toothbrush. REI has some good inexpensive choices. Cough drops. Great for dealing with the dry air. Breath mints. That one should be pretty obvious. Be kind to your fellow passengers and use them. And share them. External battery/charger for my iPod and phone. Pocket camera, video camera, and the spare batteries. Business cards. Hey, you never know. You might make a great contact and your flight pays for itself in new business! The night before. Get a good night's sleep. Don't drink any alcohol! Save the celebrating for when you get to Japan and are handed a cold Asahi (or 日本酒). At the airport. Since you cannot take a proper bottle of water through security, buy a large bottle of water from a vendor near your gate. The tap water on the airplane sits in holding tanks, which is a great way for it to collect bacteria. If an electrolyte drink (like Gatorade) is available, get a bottle of that too. What about sleeping on the flight? It's possible, even in economy. The seats don't recline far, and you can't really stretch out. You'll probably have to roll towards one side and try to keep your head or feet from hitting your neighbor. But don't count on being able to sleep during the flight. All it takes is one crying baby, a snoring neighbor, or some turbulent air to put an end to that. So don't pack or party all night, expecting to sleep on the plane. Because if you don't, that's another 16-24 hours of sleep deprivation, which only makes jet lag all the more painful. That's why getting a good night's sleep before your flight is important. If you get to pass any of the flight time with a nap or two, that's a bonus! Above all, remember that no matter how long your flight, there is an amazing adventure awaiting you once your plane lands in Japan. Be nice to your fellow travelers. Be considerate of them as you pack, prepare, board, and share the plane with them. Smartphone apps for Getting Around. A great substitute for Google Maps is MapsWithMe. It "pings" your GPS, so no internet connection is needed. No WiFi, no roaming charges. And it works great! Two of us tested the free version on the 2014 trip. One with a recent Android device (Motorola RazrM) and the other with an old iPhone4 (also available for Blackberry). The app worked flawlessly on the Android, but the iPhone had issues with memory. The download is rather large (latest update for Tokyo & Kanto region was 89MB), so make sure you have plenty of memory available on your phone. The old days of memorizing trains schedules and maps are long gone. Japan Trains for Android covers the entire Japanese train system - in romanji. From subways to shinkansen, You can plot your route, pick your schedule, and choose when you'll depart and arrive. Arrival and departure times are given for each leg of the route. Figure out if the express route really is quicker than the local. But most important of all, NEVER TAKE THE WRONG TRAIN AGAIN! Check out the screens below to see how easy it is to use. One, two, and three-day passes. A great way to save money while running around are one-day passes. Let's say you're staying at an AirBnB house in Adachi-ku, and you're going to Ikebukuro for some shopping. Maybe you'll want to drop off your shopping souvenirs before meeting friends for dinner in, say, Shinjuku. 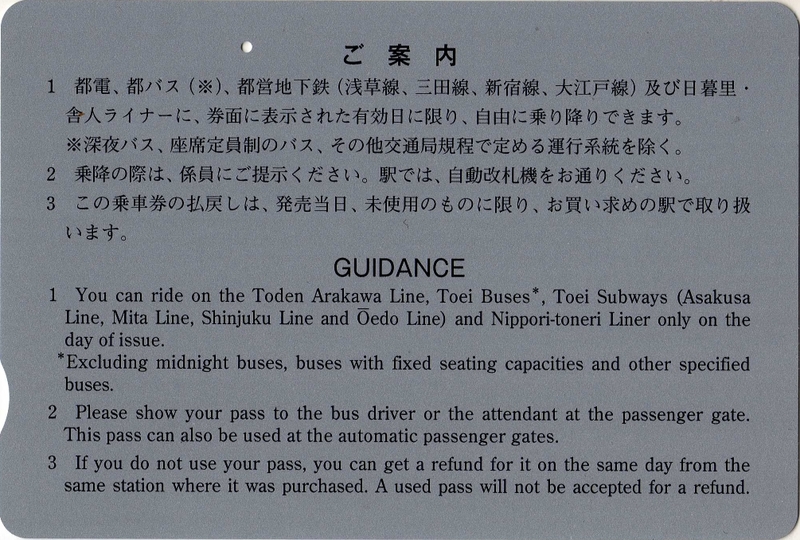 Each trip on the Toneri Liner will average around 270JPY, depending on the stop. That's 1080JPY for that day, just for that one train line. Or you can get a one-day pass at the same machine where you buy your single or group passes. The one you see below left covers not only the Toneri Liner, but also the Toei Bus system, the Toden Arakawa Line (streetcars), and the Toei Subway. And it's only 700JPY! 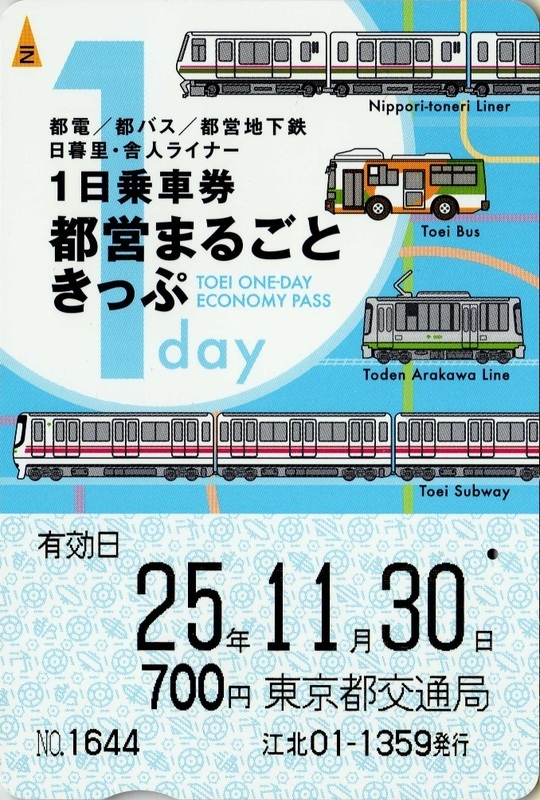 Left: Face of the Toei One-Day Economy Pass. Above: Back of the same pass, with full directions in English. 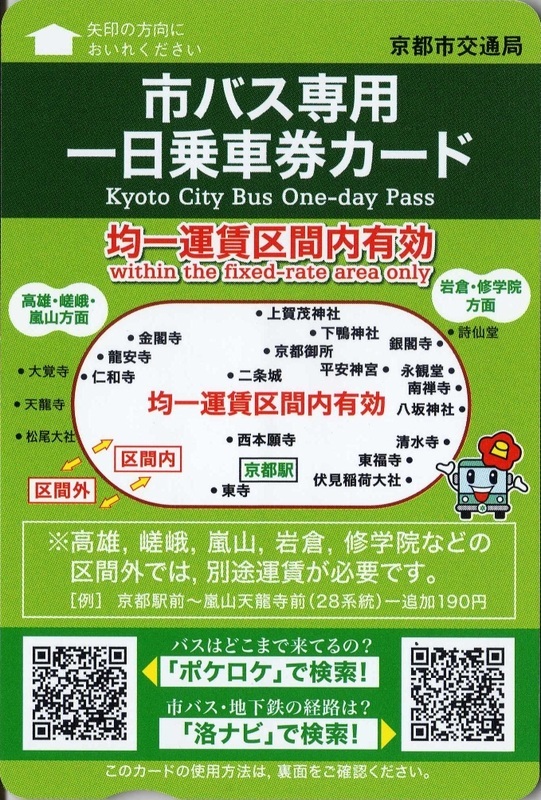 Right: Likewise, one-day bus passes in Kyoto are only 500JY, even at the height of the tourist season. Tokyo Metro has discounted one- and two-day passes available. These are for both foreign tourists as well as domestic tourists visiting Tokyo. Like the JR Rail Pass, it is best to order them in advance from a travel agency that specializes in Japanese tourism, such as JTB. These are great money savers if you'll only be in Tokyo a day or two. One-Day Ticket - Adult: 600 yen. One-Day Ticket - Child: 300 yen. Two-Day Ticket- Adult: 980 yen. Two-Day Ticket - Child: 490 yen. 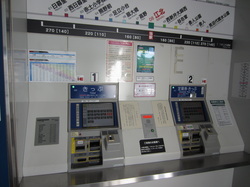 For Tokyo's subway system, there are discounted passes for one, two, or three days. 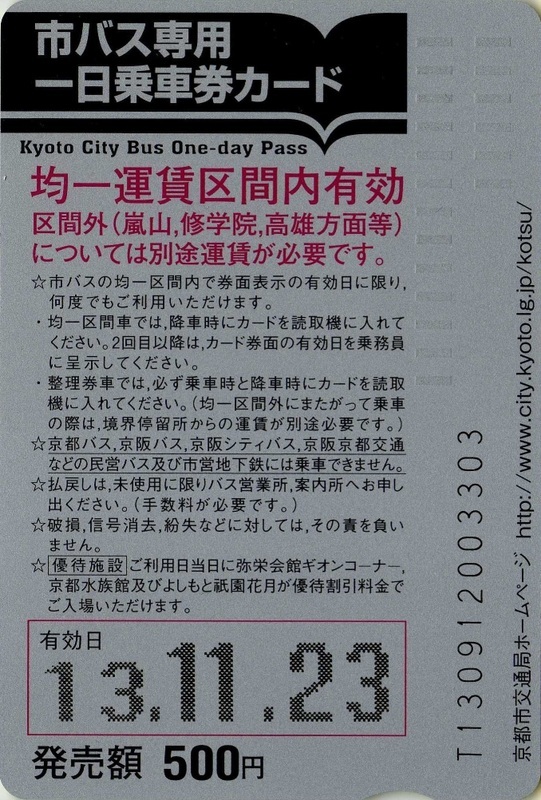 One-Day Ticket – Adult: 800 yen, Child: 400 yen. Two-Day Ticket – Adult: 1,200 yen, Child: 600 yen. Three-Day Ticket – Adult: 1,500 yen, Child: 750 yen. Toll road discounts. The Central Nippon Expressway Pass gets you a flat rate for toll roads, and can be reserved through your rental car company. As the name suggests, it covers central Japan west from Tokyo to Nagoya, up to Kanazawa, and of course all around Mt. Fuji. It's a real money-saver if you're planning a road trip in Japan. U.S. Customs and Border Protection has a new app to make getting through the customs and immigration line at the airport a bit easier. With the app, you fill out your flight information, answer the questions the customs agent will ask you at the counter, take a selfie, and the app creates a QR code. The code expires after four hours, so you can fill this out while the plane is taxiing to the terminal. When you get to the counter, just show your passport and the QR code, and you're done! Which is great if you have to catch a connecting flight in a hurry. All Nippon Airways (ANA) has a great deal for foreign tourists. Fly anywhere within Japan for only 10,800 JPY! It's called the "Experience Japan Fare", and it's perfect for visiting places far apart in Japan when you don't have time in your schedule for a shinkansen. One of my associates recently made excellent use of the deal, flying from New Chitose Airport to Kansai Airport in about two hours. Even on the shinkansen, that would be a 15 hour trip, at a price of about 32,380 JPY. There are many sites out there promising the best deals on travel. One of them even has funny commercials with William Shatner. But for the best prices and the most options, nobody beats Kayak. You can filter everything from airlines and departure times to layover airports and lengths of your layovers. When comparing prices at Kayak's competitors, you'll notice that they don't even give you a choice of layover airports. I checked Travelocity for a flight to Narita. You have to fly through O'Hare to get their "best price". In December! You might miss your flight because you're delayed due to it being winter in Chicago. And the price was almost $400 more than Kayak's best price going through LAX. On the same airline! Get exactly the flight you want. Flying to your schedule and not the limited slots made available to other travel sites can make all the difference in enjoying the journey to Japan. That's worth paying a little more, but if you can pay less, that's even better! JTB USA not only has specials on airfare to Japan, but it's also a great place to buy your JR Rail Pass. These can be bought for certain areas, or for the whole country. Most have to be bought outside Japan (Except the JR East, which can only be bought within Japan), and only the JR Main Pass (entire country) can be bought for more than 7 days. Keep in mind that the price for the pass will depend on current exchange rates. Also, a standard JR Rail Pass won't cover every train line in Japan. There are some shinkansen, for example, that are not covered and will require a separate ticket. This is all explained on the JTB USA site. Once purchased, you will receiver a voucher in the mail. You exchange that voucher at the store in Narita airport. This special JR Rail Pass is only for tourists, so if your trip is listed as "Entertainer" (such as an actor visiting to Japan to promote their new movie), you won't qualify. Fortunately, most of us are mere mortals and do qualify for this great deal. On a typical 3-week visit, my JR Rail Pass pays for itself in the first week, leaving me two weeks to essentially ride for free.